PORT RICHMOND — A proposed mental health facility in Port Richmond drew backlash from residents who pleaded with owners to move it elsewhere at a meeting Tuesday night. 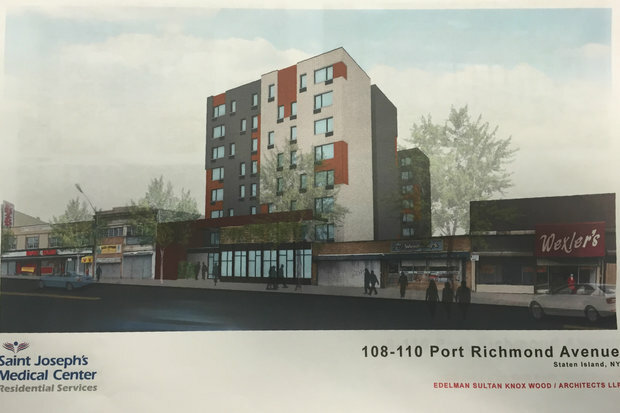 Community Board 1's Port Richmond/Mariners Harbor area committee voted not to support Saint Joseph's Medical Center's plan to put supportive housing — which mixes affordable housing units with apartments for people recovering from mental illnesses — at 108-110 Port Richmond Ave. Neighbors who attended said they were against the plan because the area was already inundated with social services. "We have more than enough of this stuff," said Debra Grant, who's lived in Port Richmond for 11 years. "We're over saturated." Marianne DiTommaso, vice president of residential services for Saint Joseph's, said the model of housing is not considered a social service and would benefit the community. "Supportive housing brings stability to neighborhoods," she said at the meeting. "Housing values are not adversely affected." The plan would turn 108-110 Port Richmond Ave. into a 77-unit apartment building with a mix of studios, one bedrooms and two bedrooms. Fifty of the units would house mentally ill patients and the rest will be affordable housing, DiTommaso said. It would include a person at the front desk at all times, services for residents to assist in things like budgeting, and security cameras installed in the front of the building, DiTommaso said. Saint Joseph's originally planned to open a similar facility at 78 Fort Place, but backed out after community opposition and sold the land to a developer who plans to turn it into more than 30 apartment buildings. DiTommaso said the new facility would only serve Staten Islanders or people whose families live in Staten Island and would not house people convicted of violent or sexual offenses. State Sen. Diane Savino, who attended the meeting, said she fought with the group to stop their plans for 78 Fort Place and had to FOIL documents to find out they planned to house patients who were released from Sing Sing prison. "What I heard leaves me with more questions," Savino said about the new plan. "I don't think this community is supportive of this plan and that's a problem." While some residents at the meeting were in favor, the vast majority were against it and asked that it be moved to parts of the borough with less social services. A survey by the board found that Port Richmond alone had nearly 50 social services in the neighborhood. DiTommaso said they chose the area because it's close to public transportation, has nearby stores and churches. Maria Morales, owner of Los Potrillos restaurant on Port Richmond Avenue, said she had nothing against the plan itself but was against where they chose to put it because the neighborhood already has problems caused by the other services. Morales said in 2008 a man drove a truck through her and other nearby businesses and people from other facilities loiter in her eatery. "We already have enough problems," she said at the meeting. "Please go somewhere else." The board voted five to two against the plan, which doesn't need approval from the city to proceed. The full board will vote on the plan at a meeting at Brighton Height's Church, 320 St. Marks Place, at 7 p.m. on July 21.